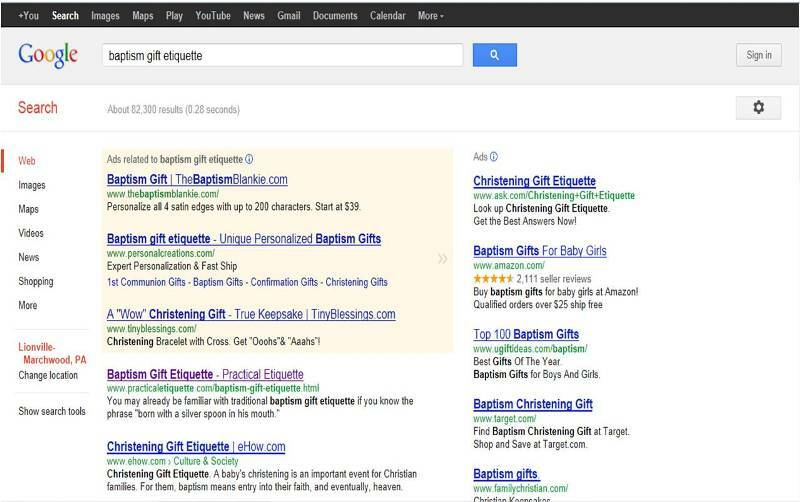 Should you advertise with Practical Etiquette? Why advertise with Practical Etiquette? Why is this site so popular? Are you looking for ways to bring in new customers? Are you spending too much on print advertising? Want to try a cheaper and more effective option? If you answered "yes" to these questions, then there really isn't any reason why you shouldn't try to advertise with Practical Etiquette. Why Should You Advertise with Practical Etiquette? When you advertise with Practical Etiquette, you'll reach a targeted audience of visitors who search the site for information on a variety of etiquette and manners related topics on a regular basis. We have visitors from over 30 countries in addition to the US, including Canada, the UK, France, Germany, Russia, and South Korea. The site's popularity has continued to grow since it went live in 2005, with new content and topics added on a regular basis. Practical Etiquette already ranks in the top 0.5% (YES better than in the top 1%) of over 200 million websites worldwide! Why Has Practical Etiquette Become so Popular? Practical Etiquette is created and maintained by an experienced business professional and family oriented person who has extensive experience dealing with the issues we face in everyday life. Through this experience, we look to apply manners and etiquette in a practical manner befitting real world experiences. 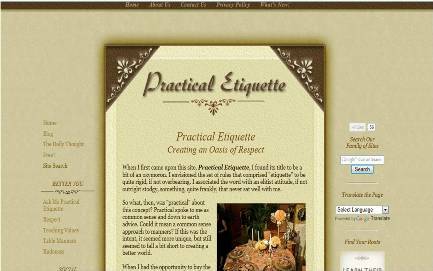 Practical Etiquette’s Ms Practical Etiquette is managed by an etiquette and manners professional, leading to its popular appeal. Practical Etiquette is much more than just an etiquette compendium of stodgy do’s and don’t’s. It is a common sense approach updated constantly with new content and illustrations. Practical Etiquette uses a special optimization process to ensure that its found at the major search engines for a variety of etiquette and manners related keywords. Visitors and search engines both seem to like the site so far, so I plan on following this formula for years to come. Please consider joining Practical Etiquette and advertise with us. We'll work together to bring visitors the useful information they're looking for. You own a Printing Company specializing in Wedding Invitations. A couple living in Lancaster, PA who recently got engaged and wish to commence the planning process. How do you think they're going to go about searching for the perfect Wedding Planning Process? Are they going to look in the Yellow Pages? Nope. Are they going to look in magazines or brochures they picked up on their last trip to the grocery store? Nope. The way they're going to search for wedding planning tips is most likely by searching on-line. 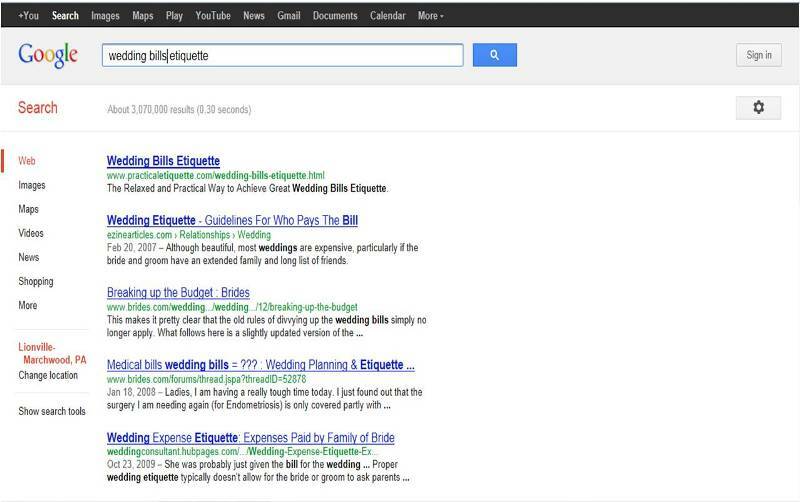 So why not list your business on a popular website that is found for countless keywords related to wedding planning? You'll be much more likely to attract that potential customer if you advertise with Practical Etiquette. No need to go into boring statistics or details here. Suffice it to say that print advertising is on its way out, and internet advertising is the future. We're even being found for image searches, which is now an extremely popular type of search online. Someone may start out just looking for an image on Google, then all of a sudden they find themselves on your page on our site all because of an image search! This option provides you the opportunity to appear on most every page of Practical Etiquette. As the pages of Practical Etiquette grows, so does your advertising exposure ... at no additional cost! Your ad will be located in the third column of Practical Etiquette. The ad will be a 180x180 pixel image, including your business name, address and telephone number, or some combination. Clicking on your ad will take visitors to your dedicated page on Practical Etiquette (if you also choose Option 3 below) or to your website. The choice is yours. This option provides you the opportunity to appear on every page on a particular topic within Practical Etiquette. As the pages of that section grows, so, too, your advertising exposure ... at no additional cost! Your ad will be located in the third column of your. This option allows a business to target their advertising to traffic particularly interested in their business. For instance, if you are a Religious Gift Store, you may want to be a Topic Sponsor for "Baptism Etiquette". Description of your business/services - You may provide any info you like, but I will write the page in my own words and style. 3-10 photos - You provide. I will choose which and how many are used. Contact Form – This invaluable tool allows visitors to contact you directly through e-mail, and you'll know exactly where they came from. Whether or not you go with Option 3 above, you may place your ad on an appropriate section of Practical Etiquette. Your ad will be the only one at the very top of your section. The ad will be a 400x300 pixel image, including your business name, address and telephone number. Clicking on your ad will take visitors to your dedicated page on Practical Etiquette (if you also choose Option 3 above) or to your website. The choice is yours. Your ad will be located on the 2nd tier (below the fold) of your section. The ad will be a 300x225 pixel image, including your business name, address and telephone number. Don't worry, you don't need a PayPal account to advertise with Practical Etiquette. All you need is a valid credit or debit card. If we agree on an advertising package, I will send you a PayPal invoice by e-mail. All you do is enter your payment information and submit. Once I receive payment, your ad will go live. It's that simple. In compliance with Google's webmaster guidelines, all links that are purchased for advertising purposes will include the rel="nofollow" attribute. Advertising is accepted only from Outer Banks related businesses. That doesn't necessarily mean you have to be based in the Outer Banks, but your business or service must have some relevance. Practical Etiquette reserves the right to decline any inappropriate or irrelevant ads or submissions. Practical Etiquette does not offer banner advertising or ads on our home page.